The story below was updated on Wednesday May 15 to reflect a correction in the original Sandvine report. Apple manufactured devices consume over 35% of all streaming audio and video on North America fixed access networks. Despite the love people have for email, Twitter and even Facebook, the real star of the web in terms of sheer traffic is video. And not only is all this real-time video streaming possibly rotting our brains, congesting our broadband networks and threatening our pay TV businesses, it’s driving wholesale changes in how we pay for broadband and the future of television. A great illustration of these changes comes from Sandvine’s Global Internet Phenomena Report: 1H 2013. Sandvine provides deep packet inspection and networking management tools to wireless and wireline ISPs, which is how it gets some of its data. While, many people already knew that Netflix (s nflx) traffic comprises about a third of the web traffic in the U.S., they might not know that YouTube (s goog) is gaining rapidly with 17.11 percent of web traffic downloaded on wireline networks, up from 13.8 percent a year ago. Few people are immune to the siren song of cat videos or Arrested Development. In fact, it’s changing the profile of what broadband usage looks like to the point where it’s normal to be a bandwidth hog. According to the Sandvine report in North America, the top 1 percent of subscribers who make the heaviest use of the network’s downstream resources account for 10.1 percent of downstream traffic. However, those top 1 percent of users don’t look too much different from the top 30 percent. At the bottom, the network’s lightest 50 percent of users account for only 6.4 percent of total monthly traffic. In fact it’s those laggards at the bottom we should be worried about. Did they somehow miss Gangnam Style? The average and median usage on both wireline and wireless networks in North America is on the rise. On wireline networks mean usage was 44.7 GB, a 39 percent year-over-year increase from 32.1 GB. Over the same period, median monthly usage increased at an even by 56.5 percent, jumping from 10.3 GB to 18.2 GB. On mobile networks mean monthly usage increased by 25 percent from 312.8 MB to 390.1 MB. Yet, median usage more than doubled from 25.5MB to 58.7 MB over the past year, driven in part by more people buying smartphones. And mobile is even bigger than these numbers make it look like (or something like that). One out of every five bits — or 20 percent of the traffic on wireline network is generated by a smartphone or a tablet. And as Wi-Fi expands and is easier to connect too, that number should continue to increase. Before people accuse me of being unfair, let me note that sending video is one of the most data heavy options around. A two-hour HD movie file can contain 4GB of data or more, while a book that might also take two hours to read would top out at several megabytes. The sheer volume of data is one reason video strikes fear into the hearts of both wireless and wireline network operators, while the loss of revenue from pay TV subscriptions keeps wireline providers up at night. 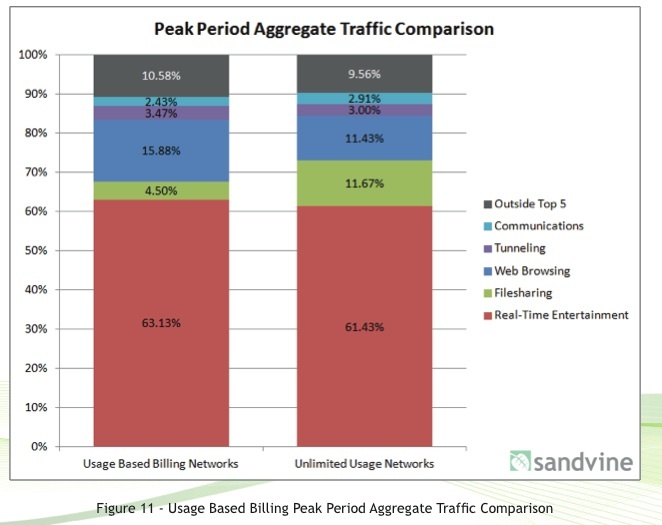 Unfortunately for those implementing usage-based billing plans perhaps in hopes of influencing subscribers to keep their pay TV subscriptions, Sandvine shows that real-time entertainment usage goes up on networks with usage-based billing. In fact, the only thing reduced appears to be file-sharing traffic. So what single home roaming device consumes the most Real-Time Entertainment traffic at over 10percent? It’s the iPad. In fact, Apple devices as a whole play a large role in the consumption of Real-Time Entertainment. If you add up all Apple manufactured devices (which includes iPads, iPhones, iPods, AppleTVs, and Mac computers), they consume over 35% of all streaming audio and video on North America fixed access networks. There’s also some good data from Europe that shows that the lowered availability of over the top options like Netflix or the BBC’s video player cause the amount of real-time streaming traffic to drop. Additionally the report shows that in Europe file sharing is higher than in North America, something the report’s authors attribute to a lack of access to certain popular content because of geo-blocking. But taken in its 40-page entirety, the data and case studies show how our love of video is causing both wireline and wireless ISPs to get creative to boost revenue and meet the challenges posed by the demand for video. Just like we said it would. The green and white table above is from from “Table 2 – Top 10 Peak Period Applications – North America, Fixed Access” in the Sandvine report. However, I’m confused about the classification of “applications” within the downstream & aggregate columns. While I can understand classifying sites like Netflix & Youtube as “applications”, I don’t understand how they can also list SSL (which is a protocol) and MPEG/Flash Video (which are formats) in the same table. Given the relatively low percentages for MPEG and Flash, I assume that they aren’t double-counting for sites that deliver video in one of those formats. I’d argue that the data might be more meaningful if the table listed only providers/sites — Netflix, YouTube, Hulu, Amazon, iTunes, HBO, etc. This would allow us to see the relative shifts in consumption patterns from report-to-report, without confusing the issue by including protocols and formats as well.